While infectious diseases such as tuberculosis and HIV/AIDS weigh heavily on Africa, cancer is a latent health burden. The International Agency for Research on Cancer (IARC) reported that there were more than half a million cancer deaths in Africa in 2008. These numbers are expected to double in the next three decades due to aging and growth of the population. Of considerable concern is the realisation that these figures could be even higher as Africans adopt western lifestyles such as smoking, poor diet and physical inactivity. Despite this increasing burden, cancer unfortunately remains a low priority for most African countries. While breast cancer remains the most lethal malignancy amongst women across the world, the incidence is still low in Africa compared to a developed region like Europe. 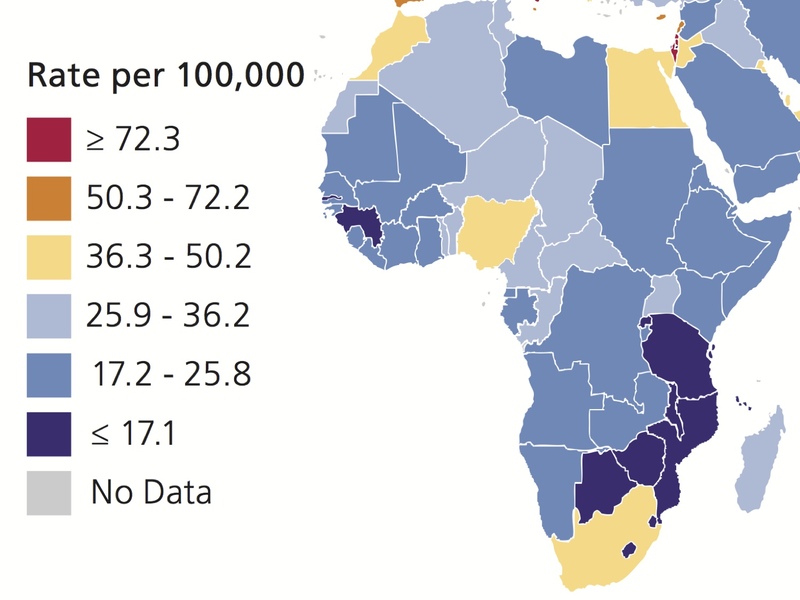 As seen in the figure below, most African countries have an incidence rate that is less than 50 per 100,000 compared with Western Europe and North America where the rate exceeds 72 and, in the case of Belgium, is over 100. Despite the lower incidence, an African woman diagnosed with breast cancer has a greater than 50% chance of dying from the disease. In most European countries that figure is considerably lower than 30%. Why is this the case? First, the age at diagnosis is a factor, with the majority of African women presenting at a younger age, before menopause, compared to Europeans who normally present after menopause. Second, the stage of presentation is much later in Africans, when the cancer has often metastasized to other parts of the body. Third, there is the likelihood that gene expression differs between women of African and European ancestry. As explored in a previous blog, the type of cancer may be quite different. The fourth and probably most important reason in the differing survival rates comes down to management. European women often have ready access to free health care which includes mammographic screening and, once the breast cancer has been diagnosed, treatment options such as breast-conserving surgery, targeted radiotherapy, adjuvant chemotherapy and expensive drugs like Herceptin and Tamoxifen can be offered. While it may be some time before diagnostic screening tools such as CapeRay’s PantoScanner platform are able to make a difference in the lives of African women, there are some simple steps that the continent’s beleaguered health care providers can take. Known risk factors – such as obesity, physical inactivity and alcohol consumption – should be reduced. And most importantly, women should learn to recognize early signs and symptoms of breast cancer and then have the courage to report to a doctor. Breast cancer in Africa has many confounders: 1. the population pyramid is skewed to the left with he mean age of death being 50 in some places, compared to Sweden where it is 80; thus in Africa breast cancer appears to be prevalent in the young. 2. it is a woman’s disease and help is sought from women and songomas, not from western medicine, and then only when it is at a late stage. 3. when western help is sought, the treatments are seldom completed. Thus one has not to look at genetics and biochemistry, but at psycho-social aspects, if improvement is sought. The most powerful tool would be awareness, and then screening after that. Thanks for this insightful feedback, David. Hopefully my concluding sentence was consistent with your own advice.